Its official, HP will start bundling Solaris on their x86 rack servers. Wow. I've posted a webrev of the Boomer tree against onnv_109. While the review itself is probably daunting, and I'm not actively asking for folks to review it, you are welcome to do so anyway. Please send us your feedback if you have any. First the Playback tab, which shows individual slider support for each of the analog controls, as well as a single monophonic "master volume" slider. If we had an older system that didn't have independent volume control, we might have an option at the bottom of the screen to select playback sources. Its not required on this system. The Recording tab shows some improvements. Instead of having just a single monitor gain control, you can now independently control the monitor gain for each of several input sources. There is only a single "record gain", but that's a hardware limitation. Notice that you have some additional features on this particular device: an optional 20dB microphone boost, and the ability to select from one of two different microphone inputs. These are device specific options. The Options tab has some other bits. First off, notice the slider that lets you control the keyboard beep volume. 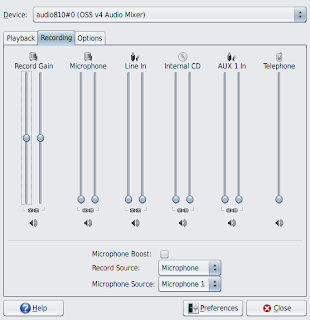 This is device specific (it requires the system to be designed to route the PC beeper through the audio codec -- a common choice on laptops), but it can be useful. On this system, you also have some jack retasking options. You can use the input jacks (mic and line in) as Surround and Center/LFE functions, as I've shown here. 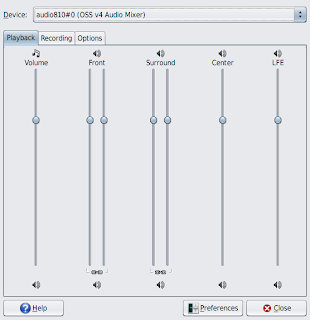 With this option, you can achieve 5.1 audio even on the original Sun Ultra 20. 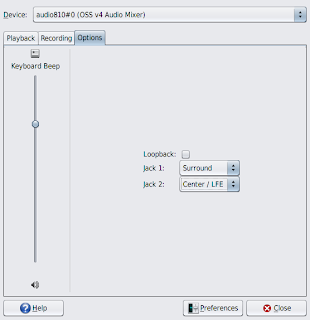 The Loopback option is intended to take your recording source and loop the input directly to the DAC output, bypassing the mixer altogether. I doubt it will be often useful, but since the hardware can do it, there is no reason not to offer the choice here. Note that most of these advanced options are not displayed by default in the application, but require you to enable them in the Preferences Dialog.